It was late afternoon before they finished the Christmas tree, and it was growing dark. They lit the old red Chinese lantern and many candles so that they could see to work. There were no glaring electric bulbs on this tree. Mrs Oldknow had boxes of coloured glass ornaments, each wrapped separately in tissue paper and put carefully away from year to year. Some were very old and precious indeed. There were glass balls, stars, fir-cones, acorns and bells in all colours and all sizes. There were also silver medallions of angels. Of course the most beautiful star was fixed at the very top, with gold and silver suns and stars beneath and around it. Each glass treasure, as light as an eggshell and as brittle, was hung on a loop of black cotton that had to be coaxed over the prickly fingers of the tree. Tolly took them carefully out of their tissue paper and Mrs Oldknow hung them up. The tiny glass bell-clappers tinkled when a branch was touched. When it was all finished, there were no lights on the tree itself , but the candles in the room were reflected in each glass bauble on it, and seemed in those soft deep colours to be shining from an immense distance away, as if the tree were a cloudy night sky full of stars. They sat down together to look at their work. Tolly thought it so beautiful he could say nothing , he could hardly believe his eyes. commentary: This is a much beloved children’s book, and one I was exceptionally rude about earlier this year. I couldn’t find the magic in the book, on the whole, but I did love this description of decorating the Christmas tree. So I will present it unadorned, without any of my mean-minded comments. The picture shows extra children, but that isn’t unreasonable, as there are a lot of child ghosts hanging around Green Knowe. 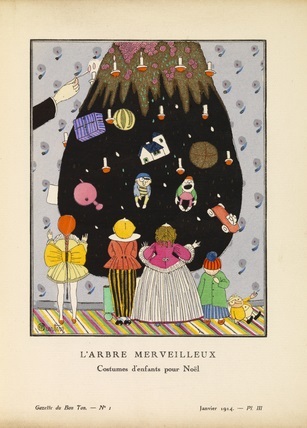 And it’s just a lovely picture anyway – it appeared in the French fashion magazine La Gazette du Bon Ton in 1914, and is from Wikimedia Commons. It is a lovely and vivid description, Moira. What I like about it is the way the magic of the season (at least for children) comes through. It really puts you right there, I think. Moira, less is more on a Christmas tree, I think. I'm always confused as to how far one should go with the decorations. It shouldn't clutter up the tree. It's a question isn't it Prashant? Part of me wants tasteful, and part of me thinks we should be like children and go overboard with the sparkle and tinsel. I do love how the children in the print appear to be wearing clothes from different eras too. Very apt! We don't decorate much for Christmas anymore, but having a Christmas tree with handmade ornaments was always a fun part of the season. And listening to Christmas carols, religions and otherwise. I grew up in a very religious household and I still love the feelings that Christmas carols evoke.